HABIT: Perennial up to 2 ft. tall with palmate leaves deeply divided into three lobes that are again pinnately dissected. 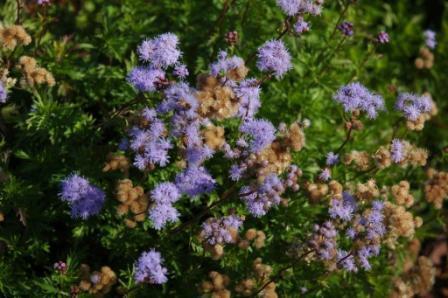 Small, purplish-blue flowers cluster together to form puffy, 2 in., cushion-like flower heads. Duration: Bloom Color: Blue , Purple Bloom Time: Mar , Apr , May , Jun , Jul , Aug , Sep , Oct , Nov.
NOTES: The species name “greggii” was named for Josiah Gregg, (1806-1850). He was born in Overton County, Tennessee. In the summer of 1841 and again in the winter of 1841-42 he traveled through Texas, up the Red River valley, and later from Galveston to Austin and by way of Nacogdoches to Arkansas. He took note of Texas geology, trees, prevalent attitudes, and politics. At the same time, Gregg began compiling his travel notes into a readable manuscript. His “Commerce of the Prairies” was an immediate success. In 1848 he joined a botanical expedition to western Mexico and California, where he sent specimens to the eminent botanist George Engelman in St. Louis. 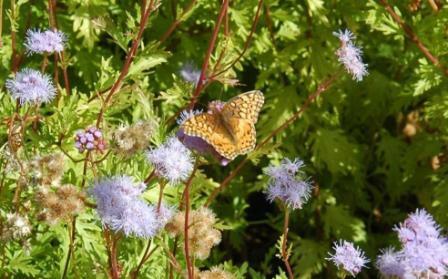 Subsequently, the American Botanical Society added the Latin name “greggii” in his honor to twenty-three species of plants. Gregg died on February 25, 1850, as a result of a fall from his horse. USES: Can be a good ground cover and spreads easily by roots. Often attracts very impressive numbers of butterflies.